The last three months of my life was dedicated to this year's StarChefs ICC-International Culinary Congress 2015 held just this past October in Brooklyn. In it's 10th year, this is the largest food conference in North America! Chefs from all over the world, mainly the U.S., gathered under one roof -to learn, to experience, and to get inspired from each other...and from everything in their line of vision. Where else will we be able to brag about being five feet away from MIchel Bras & Jose Andrès (just to name a few). This definitely was the largest event I was involved in, as this three day congress held close to 1,500 folks in one space, with one event team. I had the amazing...let's just say one-of-a-kind opportunity getting involved at this year's ICC. Why? one of my main projects under my belt was to spearhead the first 'Ramen Battle' at ICC. Was it because I was Asian? As I jokingly asked my director. Well, that may be partially true, haha. Whatever the case may be, this was the most exciting part of my whole process. I could go on and on about Star Chefs, or what I learned from ICC in general. However, to be on the main stage and get to know some pretty freakin awesome Ramen Masters + other chefs, was truly a moment I will definitely never forget. I'll let these photos speak for themselves. The prep that only we saw behind the scenes during the Ramen workshops. The rules of the Ramen Battle: Five Ramen Masters and their teams (5 randomly selected for each team) have 2 hours to prep their broths the day before the battle. They are not 'allowed' to touch anything, and can only guide their teams to create their secret recipes. On battle day, the whole competition is only 45 minutes (including introductions, plating, judging). Not a whole lot of time. Oh, and to make it just a bit more complicated-each team has to prepare 50 samples per team (totaling 250) for the audience to give it a try. Did I hear complaints from the Ramen Masters before the competition? Well, they were very creative in their responses, and the feedback was definitely constructive. Harold Jurado cooking up some ground Kangaroo! Jamison Blankenship from Chuko sharing a few words with his team. Youji Iwakura from Snappy Ramen concentrating on his broth. This is serious business. Richie Nakano's broth-looks pretty insane if you ask me! Warming up the broths back stage before the battle...all the broths were boiling for 6+ hours the day prior, and we boiled it up for another 5 hours before the competition. And so it begins...why do all the teams look so chill? 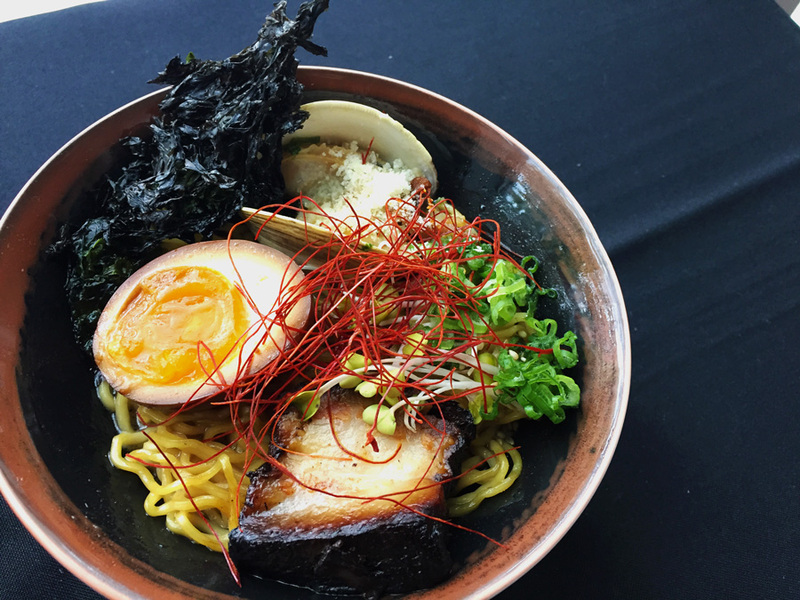 And the winner is Mihoko Obunai of Mibo Ramen, Atlanta! Quick smiles with some of the Ramen Masters on main stage. My moment with these judges...when will I ever get another chance to smile with these dudes! The one and only Jose Andres on main stage (not the best photo). Jose Andrès was the opening presenter on the main stage. Hailing from Spain + background includes apprenticing at Ferran Adria's of El Bulli. You may have seen him on Anthony Bourdain cooking with Eric Ripert, and endless publications around the world. His latest addition to the Think Food Group is 'minibar by Jose Andrès' in Washington D.C.
Michel Bras on main stage!!! The final presentation was a very spiritual piece. You could just see that he developed a relationship with each and every ingredient used, and this is how they responded to him. Wow. The crowd that just poured onto the main stage as soon as Michel's presentation was over! All the sponsor booths provided some amazing eats, where they featured ICC chefs...this clam stir-fry presentation was definitely Instagram worthy! Angus An of Maenam, Vancouver doing a little clam stir-fry at the Vollrath booth. Amazing Jamon from the Spain booth. Smiles with Ken Oringer of Toro at the Welcome Dinner first night. Photo cred-Megan Swann. StarChefs crew glazing over Michel's ingredients...the last moment before the final wrap!